Proton is Audio Damage's take on the classic Karplus-Strong tuned delay line physical modelling synthesis. Take a capable "vintage digital" style delay line with 1V/Oct clocking, and add an enveloped noise burst, and you have a plucked string physical model. We wrap this up in some of our standard Audio Damage aural hijinks, and Proton is the result. Starting with the delay line, which is "tuned" via the coarse and fine tune knobs, we then add a quality low pass filter (modelled on the MS20's LPF) and damping circuits. We hit this with a noise burst from an analog random number generator that passes through two more filters and an envelope with decay to produce the plucked sound. A "CHOKE" input empties the delay line, for extra dynamic control. Since Karplus-Strong synthesis lacks bottom in general, we have a "SUB" control that adds a sine at the fundamental frequency to produce gut-churning low end in the bass register. The result is a physical model synth that is capable of both delicate harp-like plucks and monster face-melting basslines. 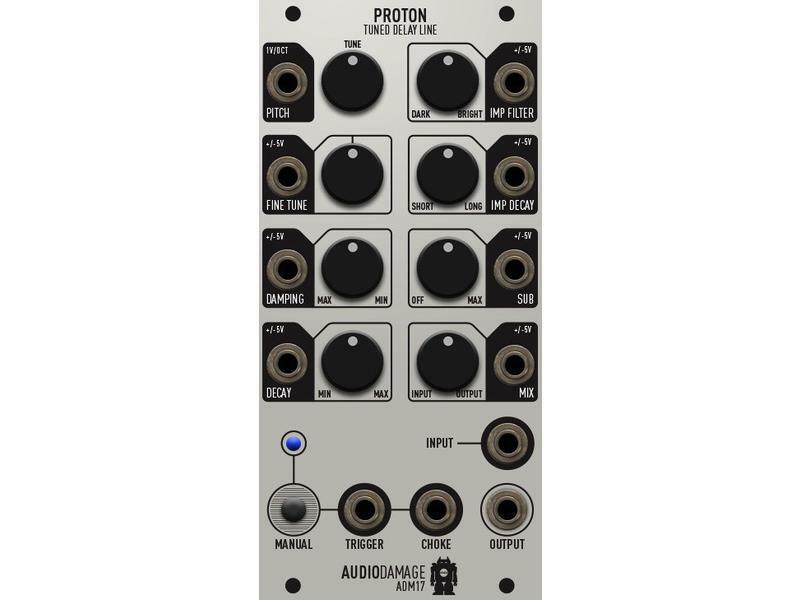 • Proton is a DSP-based module that runs at 48kHz sample rate and 24 bit depth, via a high quality Cirrus-Logic codec. • The PITCH control sets the delay time, while the FINE TUNE knob provides further control. The PITCH input responds to 1V/Oct. • The DAMPING control is the corner frequency of an MS20-style low pass filter in the feedback path of the delay. • The DECAY control is an additional feedback amount control, not normally found in KS synthesis. This enables bright tones with short decays. 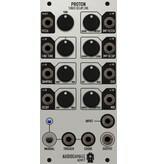 •The IMP FILTER controls a pair of filters on the noise burst impulse. At 12 o'clock there is no filtering. Anti-clockwise controls the corner frequency of a low pass filter, and clockwise the same for a high pass. This controls the timbre of the impulse, and the resulting pluck. • The SUB knob controls the level of a sine wave, the frequency of which is set by the PITCH and FINE TUNE controls. This allows a false low end, normally missing from low-pitched Karplus-Strong plucks. • MANUAL and TRIGGER fire the internal impulse. CHOKE closes the DECAY value, and this is not reset until a new TRIGGER is received. • Proton can be used as a normal delay with the input; the DAMPING, DECAY, and MIX control the level, while PITCH sets the delay time.